I believe there are two type of people in the world — those who love cake batter + cookie dough in their unbaked form, + those who don’t. I fall into the former category. I have lots of fond memories of watching my mom bake cakes + cookies when I was growing up, always offering me a batter-covered spoon to lick or a scoop of cookie dough to nibble on. And thus, my love for cake batter + cookie dough was born + has been going strong ever since! When I came across these festive cake batter truffles over on the sweets life, I bookmarked ’em immediately, knowing I’d make them as soon as I had the right occasion. This past weekend, we celebrated both my mother-in-law’s birthday + our nephew’s birthday – what more perfect occasion for cake batter truffles than two birthday celebrations in two days?! The result? These truffles are absolutely delicious. For a cake batter lover like me, they’re pretty much heaven in truffle form. The cake batter is moist, flavorful + oh-so-pretty, with colorful flecks of sprinkles, while the white chocolate coating has a lovely crunch that works perfectly with the batter center. And the sprinkles on top? Just plain adorable. =) Although raw egg in cake batter has never stopped me from eating it, for those of you who are wary, you’ll be happy to know that there’s no egg in this recipe, so you can eat ’em without worrying. Next time you have something to celebrate, give these wonderful cake batter truffles a try – you will not be disappointed! Beat together butter + sugar with an electric mixer or stand mixer until combined. Add cake mix, flour, salt, + vanilla, mixing well. Add milk + beat until a dough consistency forms. Stir in sprinkles. Roll dough into one-inch balls (or smaller, if desired). Place on a cookie sheet lined with wax or parchment paper. Chill for 15 minutes in the fridge or freezer. Melt almond bark or candy melts in the microwave in 30-second increments, stirring after each increment. When bark is smooth + melted, stir in cake mix until smooth. 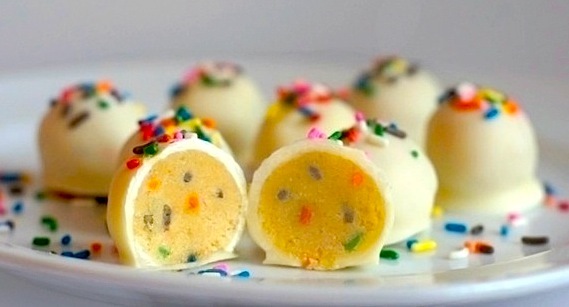 Dip cake batter balls in melted almond bark/candy melts to coat completely. Remove with a fork + place on wax or parchment paper-lined baking sheet. Decorate immediately with sprinkles. Store in an airtight container in the fridge. This looks so so so good! I adore cake batter, and these look so beautiful and tasty! Amy! These are so freaking cute! I just bookmarked this guy to maybe make this weekend. I love your new year’s resolution btw. Great idea! ha! aren’t they adorable? report back on how they turn out for you – i absolutely loved ’em! I know this will get lost in your flood of comments but I can’t even begin to tell you how amazing these look – and that cross section has me absolutely salivating!!! it absolutely didn’t get lost in my comments, + i’m so glad it didn’t because it made my night. =) thank you so much for your kind words + i’m so glad you found your way to my blog. cheers! I love cake batter anything. These are super cute and perfect for Valentine’s Day! amy – i made these this weekend and they were divine! i brought them to a friend’s house for dinner and folks raved about them…and i may have had one for breakfast with my coffee. i used pink and red sprinkles for a valentine’s day feel. thanks! 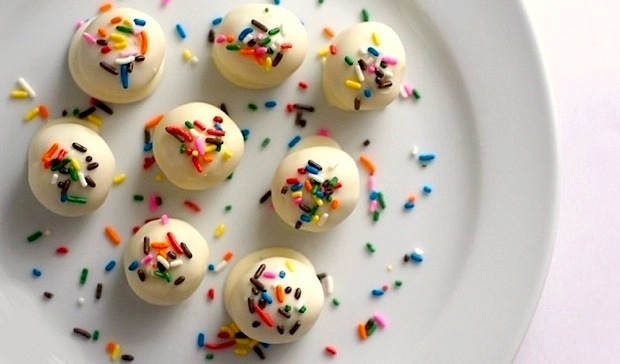 Ok so I know it’s been awhile since your original post, but I was looking for a recipe using yellow cake mix and I ran across these adorable cake batter truffles. Luckily, I had everything I needed (except for pink chocolate instead of white). They were super easy and look and taste amazing!! I have one question though…why cake mix in the chocolate? These are delicious! I made them last night, but made half of mine dipped in dark chocolate which was also great! I absolutely love dark chocolate, so I totally approve of your adaptation. YUM!